Got to spend about 45 minutes at one of the homeless camps today, located by the Kmart at Dale Blvd and I-95. Learned a lot. — If you are a private organization that offers a warm overnight place for the homeless to go you might have the county fire department inspecting your premises looking for any building code infraction before anyone can use your facility. — Propane is the #1 means of cooking and heating, and it is in very short supply. For whatever reason there seems to be some liability with handling propane and so some organizations avoid collecting and distributing it. — Gifts of water are very important. We all need water. Dehydration is common among the homeless. Water is always good to give and inexpensive. — Giving money to the homeless is not a good practice. It will seldom get used for good purpose, and can even encourage crime. — Homeless camps in the area have different community values. The camp by the Staples near to I-95 is considered to be 90% drug users but the camp by the Kmart by I-95 is more family oriented; a number of the camp’s members have jobs and even have children in the camp. — A demographic study of the homeless in the five main (current) camps has been done by a local church seeking to understand the homeless better. — There are quite a few private groups organized locally to help the homeless subsist. — Of great need: durable tents, heavy coats, propane heaters, water and basic easily prepared food (canned soup beats cups of noodle/ramen as water and heating is needed to eat them). >> I hope to cover the homeless situation more over the next few weeks and months. Am very much in self-education mode. You can read about it but that would be a poor education. One remark by an assistance organizer stayed with me today. Her background has been working with the homeless for about the last five years as a private group: Many or most of these homeless will always be homeless, for one reason or another. It is a shame however that some accommodation cannot be found where they live homelessly with some dignity and access to some basic services. (Paraphrase, not a quote). Homeless by the Kmart are concerned about being evicted from the woodlands where they live. 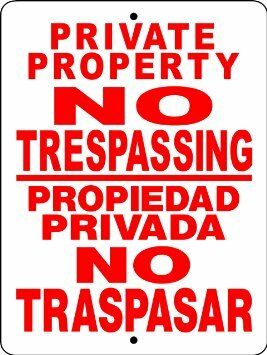 A ‘No Trespass’ sign in English and Spanish was erected about a month ago. Yesterday a TV news crew came out to a story on the homeless camp. The sign was there when they arrived and it disappeared (as of Sunday, Dec 7th) shortly after they left. Are Prince William County, Virginia citizens getting a shellgame on proffers and taxes re Stone Haven development? If the $24.25 million proposed valuation for Stonehaven is accepted, then the applicant would be able to avoid paying about $14 million in proffers (the difference between the market value of the land and the 2014 proffer level). StoneHaven is an 882 acre, 1650 home development proposed in the western end of the county (near Jiffy Lube live). As part of the proposed development, the applicant has proffered 91.2 acres of that 882 acres as a site for a high school – something PWCS desperately needs. By law, counties are entitled to receive proffers; land, cash, roads, or a combination of those, as compensation for the cost of constructing facilities for public services, like schools and fire stations, that new development requires. * To make a reservation, contact: secretarycommitteeof100@gmail.com no later than NOON, Monday, September 15. As a Member of the Republican Study Committee, he is a leader in the fight against massive government spending and has offered numerous amendments to cut spending. Rob serves on the House Armed Services Committee and the Committee on Natural Resources, where he is well-positioned to represent the needs of the First District. He has quickly earned a reputation for being an advocate for our men and women in uniform. On the Armed Services Committee, Rob serves as the Chairman of the Readiness Subcommittee, and also serves on the Subcommittee on Seapower and Projection Forces. In addition, as Co-Chair of the Congressional Shipbuilding Caucus and Chairman of the Naval Academy Board of Visitors, he is a staunch advocate for a robust Naval fleet and a healthy domestic shipbuilding industry. Rob has also earned a reputation as a strong supporter of our veterans and is fighting for full concurrent receipt of veterans’ disability and retirement benefits and recently led the effort to ensure the cut to veterans COLAs was overturned. A champion of the Chesapeake Bay, Rob serves on the House Natural Resources Committee, to which he brings his professional expertise in water quality, the environment, fisheries, and other natural resource issues. He is a leading voice for the Chesapeake Bay – for its economic, environmental, and recreational attributes – and has passed legislation increasing the accountability and effectiveness of Bay clean-up. He also Co-Chairs the House Chesapeake Bay Watershed Caucus to educate others in Congress about the Bay. Prior to his election to Congress, Rob served most recently as Field Director for the Virginia Health Department’s Division of Shellfish Sanitation. Earlier, he worked for many years as an environmental health specialist for local health departments in Virginia’s Northern Neck and Middle Peninsula regions. He holds a Ph.D. in Public Policy and Administration from Virginia Commonwealth University, a Master of Public Health degree in Health Policy and Administration from the University of North Carolina, and a Bachelor of Science degree in Biology from Virginia Tech. 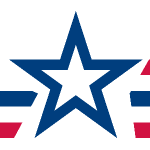 Rob has served in several levels of government, from Town Council to the United States Congress. Rob won his first campaign for public office in 1986 when he was elected to the Montross Town Council, where he served for 10 years, four of them as Mayor. In 1995, Rob was elected to the Westmoreland County Board of Supervisors and was elected its Chairman in 2003. In 2005, voters in the 99th Legislative District elected Rob to the Virginia House of Delegates, where he served until he was elected to the United States House of Representatives in 2007. Rob’s wife, Kathryn, a teacher at Cople Elementary School in Hague, is a Westmoreland County native whom he met when he spent high school and college summer recesses working in a Leedstown tomato cannery and on a Reedville fishing boat in the Northern Neck. They live in Montross and have two children: a daughter, Devon, son-in-law Daniel Gooch, and son, Josh, and his wife, Tiffany. Rob and Kathryn are proud grandparents to three wonderful grandchildren, Morgan, Mark, and Macon. Rob is an avid hunter and fisherman, and when possible, he enjoys spending time with his four yellow Labrador Retrievers. Chincoteague, Virginia sinking or the waters rising? The people of Chincoteague are engaged in a battle at the water’s edge against rising seas. All along U.S. shores, people, businesses and governments are confronting rising seas not as a future possibility. For them, the ocean’s rise is a troubling everyday reality. Reuters gathered more than 25 million hourly readings from National Oceanic and Atmospheric Administration tide gauges at nearly 70 sites on the U.S. coast and compared them to flood thresholds documented by the National Weather Service. The analysis was then narrowed to include only the 25 gauges with data spanning at least five decades. During that period, the average number of days a year that tidal waters reached or exceeded NOAA flood thresholds increased at all but two sites and tripled at more than half of the locations. About that Virginia earthquake yesterday – rumor roundup! RUMOR Roundup – The Weather Channel says yesterday’s East Coast earthquake was caused by an unknown fault line running under D.C. and through Virginia. It is now being called Obama’s Fault, though Obama will say it’s really Bush’s Fault. Other theories are that it was the founding fathers rolling over in their graves or, that what we all believed to be an earthquake was actually the effects of a 14.6 trillion dollar check bouncing in Washington. Original source: found floating on Facebook. Was wearing a life preserver so I hauled it in. Original author unknown. One Year Later — I’m not Satan, and you ain’t Lucifer … even though you drink coffee, tea and/or koolaid. One year ago today on a very cold, snowy Saturday I got up and went to the national kickoff of the Coffee Party, here in Prince William, Virginia. I also explored the TEA Party, even becoming a local chapter founder and coordinator. Have since gone inactive with both TEA and Coffee. But along the way I met some of the most amazing people. The Prince William Coffee Party had a very short life. Stuff happens. However, I have made a number of lasting relationships with these folks. And I look forward to working with them for years to come. As an independent-minded American I have questions. Am looking for answers. Life is complex. I want more than simplistic answers. I’m not Satan, and you ain’t Lucifer … even though you drink coffee, tea and/or koolaid. OK, so I did it. I went to the local Coffee Party on Saturday, March 13th. I’m conservative with a long track record of supporting whatever walks the right side of the street. Although born a Democrat, back in 1972 I even joined the ‘Democrats for Nixon’ campaign as a highschooler — in Florida there were no Republicans elected to state office until 1978. None. Long story short: I have never identified with liberal or Democratic groups, even though I was born a Democrat — registering as a Republican only when that other former Democrat ‘God bless Ronald Reagan’ ran for president. Bottomline: I wasn’t sure how these Coffee folks would take to someone with an NRA ballcap, who openly describes themself as conservative, or how they would deal with someone willing to discuss issues from a more conservative perspective. Certainly I have seen how more liberal-minded people were treated by the opposing view in my community — not a pretty sight. Our group conversation focused on issues that we all individually believe should be of interest and worthy of group investigation. The issues added up: 15, 20, 25 … perhaps 30 different issues got listed. Then each participant got two votes to select two issues that they personally would like the group to focus on. Issues with the most votes were rolled into four study groups. Hmmm … so the rumors that I heard beforehand that this was just a disguised group pimping for liberal causes or the Democratic party were … they were … bogus. Solidly bogus. By the day’s end I found myself in the ‘Financial Oversight’ issue study group responsible for issues such as taxation, banking regulation, etc. Boom! So now we would get our agenda if it were ever to happen. Someone would surely guide the study groups to what breadcrumbs should be followed. Nope. Didn’t happen. We six group members decided what topics we wanted to study, set our own agenda for meeting, created a Facebook page to exchange info and to build whitepapers that can be used within the group and for approaching our legislators. The Coffee leadership didn’t even get involved in asking what we had decided upon. They’ll find out when we report back later in the month. America stands at a crossroads. We are always arriving at some crossroad but the issues today are huge and imminently in front of us. The outcome will directly affect our children and grandchildren, leaving them incredible debt. We owe trillions to foreign countries and investors (and to Americans, too) — almost $2 trillion is due in October 2010 to pay back money borrowed in the early 2000s. We have major healthcare issues that are at an impasse; our system is one of the best medicine that people can buy. Yet we rank just ahead of Cuba in the general health of our population. Obamacare to me is an abomination that will bankrupt the country and yet the alternative is “personal responsibility” — even though healthcare insurers are a monopolistic industry and some recently announced hikes of 25-36% in annual premiums. Enough of labels. Enough of political party hacks and support groups — both the Democratic and Republican parties are focused on the next election. Neither can be trusted to hold real discussions and to make hard decisions. Each put party before country. As for all the liberals, moderates, conservatives and wingers of every stripe: I’m not Satan, and you ain’t Lucifer … even though you drink coffee, tea and/or koolaid. If you want to sit down with me and discuss issues then good. Check your name calling and label machines at the door — I don’t have time for you or that if that is what you are about. I’ll meet with you any time and any place — except Sunday afternoons when I’m either enjoying my Second Amendment rights or playing soccer, or doing both. BTW – I drink both tea and coffee. Both are OK with me. I do more than just think about economics, politics and my 401K. Sometimes I fish, go to the beach when I can and never ever miss the county fair. 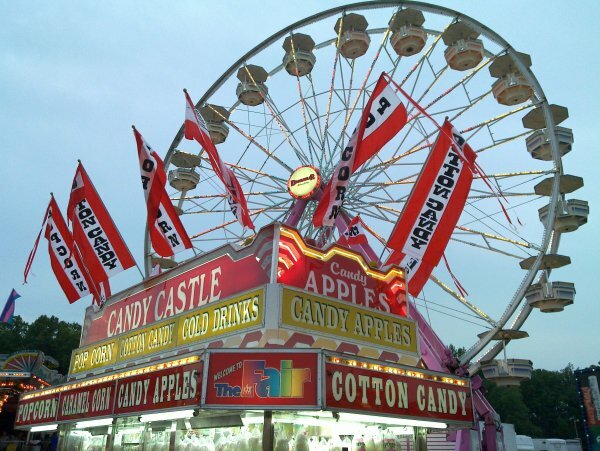 When growing up my mom and dad would take us to the county fair, except in Jacksonville, Florida it was always in October … just too darned hot to have fun outside in Florida during August … except at the beach. My dad would take some of the younger kids and go do rides. My buddies and me would hang with my mom. She liked food and so did we. My mom’s favorite was a nice roasted Polish sausage covered in green peppers and onions. That was her big ‘to do’ at the fair. She was happy just walking around and seeing the lights and people watching. Have always been fond of the side shows. 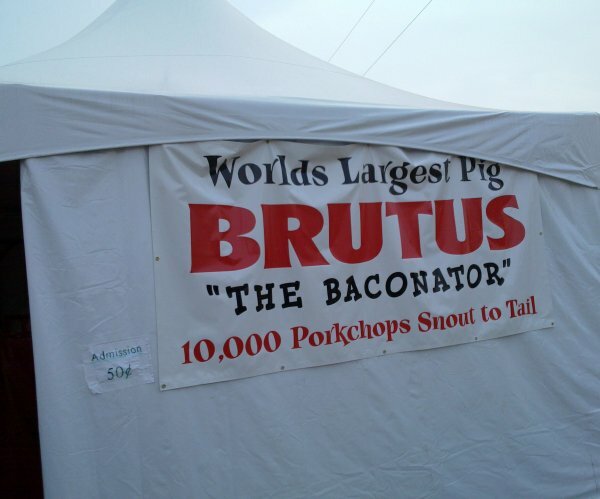 The Prince William County, Virginia fair had live music, and motorcycle jumping and Brutus: the world’s largest pig, AKA ‘The Baconator’. I paid 50 cents to see Brutus and if you want to see him then you need to pay your 50 cents, too. However, I will tell you that Brutus is absolutely humongous. Giant. I cannot imagine Brutus getting up without having a heart attack. … And in fact, Brutus did not get up the whole time that we were there. He just laid about and snorted. It was nice. I had a Polish sausage in honor my mom, saw the lights, watched the people, did the shows and petted the animals — yes, even I still enjoy the petting zoo. 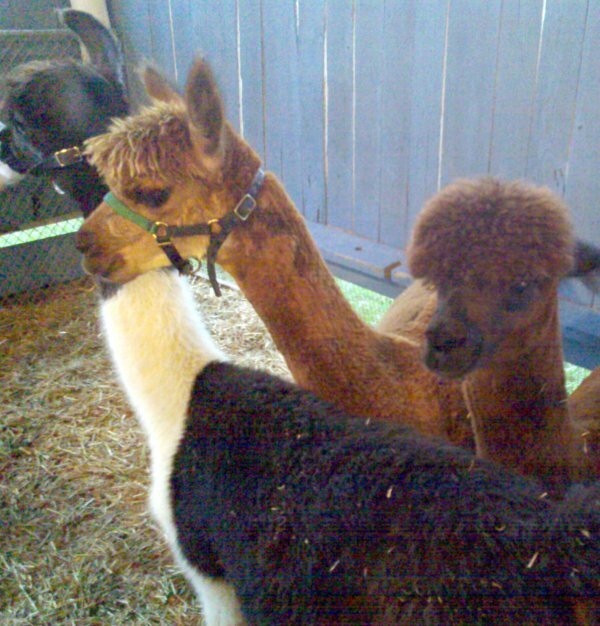 My favorite was the llamas and the minature horses … I have a dog bigger than the horses. Some folks overlook the sheer inexpensive entertainment value of the county fair. There was no charge to park, entrance cost adults just $8 and the food was outstanding in cost, variety and portion. Before I left to go home I stopped by to pick up some dinner for the folks back at home. A very large turkey leg, side of baby back ribs, and two roasted corn on the cob cost me $21. That’s an incredible bargain compared to a large bag of popcorn and two drinks costing $18.50 at our local chain movie theater. Gotta love the County Fair!